Use them for a fundraiser, better than chocolate and you keep 85% of the proceeds! See a closeup picture of the seed pack here. Thinking about a release of many live Butterflies Click here. 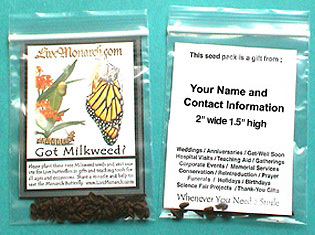 We have created a wonderful personalized Butterfly garden seed pack to give your friends, clients or customers a thank you gift that will be saved and remembered. With every sighted Butterfly your gift will be appreciated all the more. Excellent retention of materials and your specific information, as much as we can print. Custom sizes available. You can share in future sales of Butterfly items from LiveMonarch.com... a full 10% of any sale! Fast turnaround time to produce, Min. 30 pcs. for personalization. This gift is sure to please and will have long term benefits for everyone! 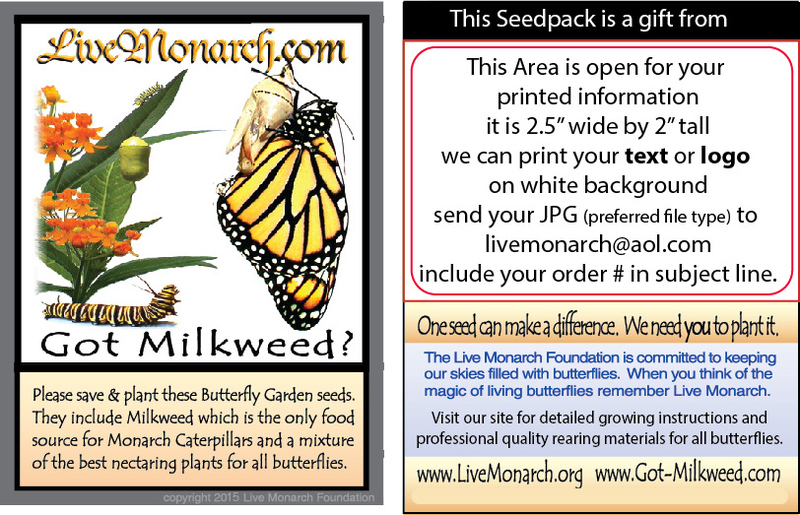 We handle in turn custom orders from 30 - 30,000 with care and pride and thank you for helping us find new hands to plant milkweed for the Monarchs. What types of seeds are in our packs?